Since hearing Stephen Sondheim talk about his life in musical theater last year, I've been on a mission to see more of his shows. And I've done pretty well so far: A Little Night Music on Broadway last year, Into the Woods at Bloomington Civic Theatre earlier this year, and the filmed concert version of Company at my local movie theater last week. 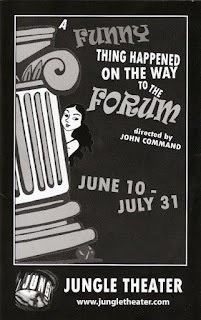 A Funny Thing Happened on the Way to the Forum is definitely the lightest of these pieces. Nothing serious or thoughtful about it, just a ridiculously good time. As usual, the Jungle puts on a wonderful production. I wasn't sure how they would fit a big musical onto their tiny stage, but it works! As Jungle Artistic Director Bain Boehlke said to director John Command when he asked about the space limitations, "well, Rome is crowded." But the show doesn't feel crowded, it feels intimate and immediate, as if we were all gathered in some ancient Roman theater, watching the spectacle unfold before us. The cast of 20 features real life married couple Richard Ooms and Claudia Wilkens as married couple Senex and Domina. Richard is hilarious and slightly creepy as "That Dirty Old Man," and Claudia is a commanding presence as his wife. Senex has two slaves, the dedicated Hysterium (Jon Whittier), who only wants things to return to normal, and our narrator Pseudolus (Christopher Teipner), who dreams of being "Free!" It's this dream that spurs on the action of the play, as Pseudolus finagles and manipulates to bring together Senex's sweet and earnest son Hero (Eric Heimsoth, who also appeared in Into the Woods) with his love Philia (Amanda Schnabel). If he succeeds, Hero promises to give Pseudolus his freedom. One big obstacle keeping the lovebirds apart is the soldier Miles Gloriosus, who has already "bought" the lady in question. Bradley Greenwald (one of my favorite local actors) plays Miles in all his pompous splendor. What first drew me to Bradley was his incredible voice, but he's also a very fine actor. He brought such depth to his performance as the emcee in Frank Theatre's Cabaret earlier this year. But there's nothing deep about Miles Gloriosus, he's all bravado. And Bradley steals every scene he's in, with just the look on his face or the way he walks across the stage in his full and glorious armor. My favorite comedy moment is when he imitates a Glockenspiel. If you get the joke, it's hilarious. Bradley and the Jungle are reprising the show I Am My Own Wife, for which he received an Ivey Award, later this season, which I'm very much looking forward to. The rest of the cast is entertaining as well. I particularly enjoyed "The Proteans" - five men who play various roles and also perform some impressive and inventive choreography. Josiah Gulden is the smarmy, overly tan, mustachioed owner of the whorehouse, in which half a dozen lovely and diverse "courtesans" reside (reminding me of another Sondheim show, Gypsy - “You Gotta Get a Gimmick”). The whole cast plays together beautifully and hilariously. 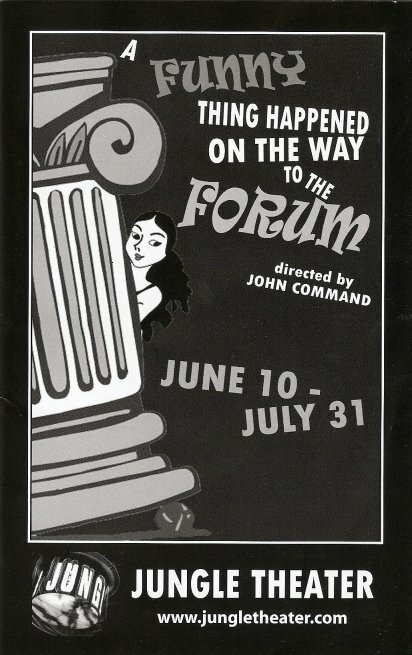 A Funny Thing Happened on the Way to the Forum is playing through the end of July. It's a fun, light, entertaining, ridiculous, great summer show.